We're not much for formal get-togethers, typically just telling everyone "come on over, we'll make [fill in the blank here]." And with that our friends will join us, bringing along more food to share, or drinks, as if it is a potluck, though no one named it such. I find this makes home feel even more like home: warm, relaxed, and comfortable. Some times I get a recipe fit for a party in my head, so I'll whip it up but the surroundings rarely change. To me baked brie has always been a little on the fancy side when it comes to appetizers, but not because it's difficult to make. On the contrary, it's one of the simplest appetizers you can make, and it comes out of the oven looking rich and ready to die for (I mean, it is melted cheese, after all). 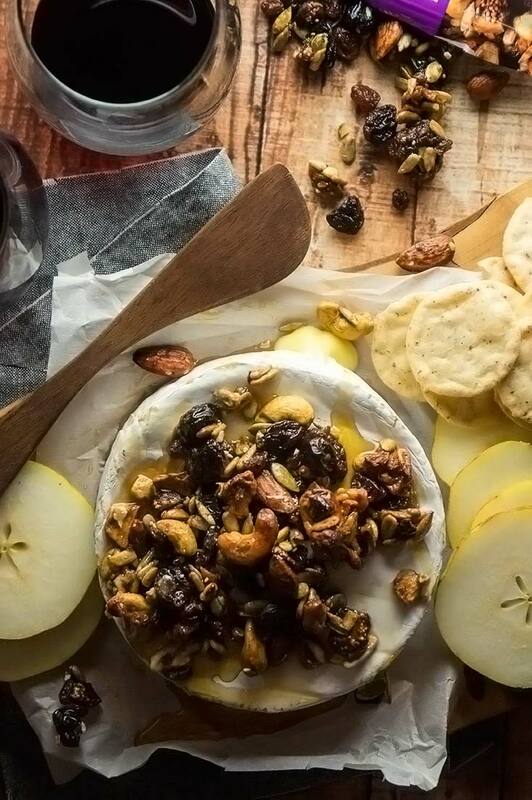 For guests I'll serve baked brie with crackers, but I myself enjoy spreading the stuff on pear and apple slices--the sweet & savory combination has me hooked. Plus, this baked brie is topped with a fruit and nut mix (which makes it really easy to make) and also lends it's self particularly well to being spread on pear slices. And I know, I know, this recipe is not the *most* resolution friendly, but maybe your New Years resolution is to spend more time with people you love? In which case this one is perfect. Or perhaps you're resolution free this year, and if that's the case, dive right in! Made in Nature provided me with product, but the recipe and opinions are all my own. Working with brands to develop wholesome recipes is one way I keep Foraged Dish going! Made In Nature helps me stock the pantry and keep the blog going. I only work with brands that I truly enjoy and use. With only three ingredients, this brie is party ready in a few minutes! 4 ounces of your favorite fruit & nut mix— I used the Maple Balsamic Mix from Made in Nature and it paired really well with the cheese! Preheat over to 350°F. Place cheese in baking dish. Pile fruit and nut mix over cheese, and drizzle with maple syrup. Place in oven and bake for 10-12 minutes, until cheese is soft but not melted. Serve: my favorite things to serve this with include slices of pears and apples, crackers/pretzels, and sliced carrots or cucumbers.